The secret to understanding the ancient woodland cover in northern Europe and America is to appreciate the relationship between meat on the hoof, and deciduous woodland. Shortly after the last ice age, enormous herds of steak rampaged their way across the countryside, ripping, munching and felling the vegetation in the countryside. Although European rainfall is higher, as they do in modern Africa, the northern equivalent of elephants, woolly mammoths, would have torn down trees, and brought down branches for food. All this dynamic activity would have had a profound effect on the ecology of those days. Native Americans saw the importance of this balance, and did not treat the huge herds of bison that roamed as an unlimited resource that would continue without some sort of management. Not so the stone age human equivalent in Europe. Here, bison and grazing animals were brought to the verge of extinction in prehistoric times through uncontrolled hunting and lack of management. It was Franz Vera who, in his ground breaking book Grazing Ecology and Forest History, brought to the attention of ecologists the importance of the balance between grazing and woodland in the northern hemisphere. An understanding and appreciation of the finest, most natural non man managed woodland moved from forests in Poland to the British New Forest. 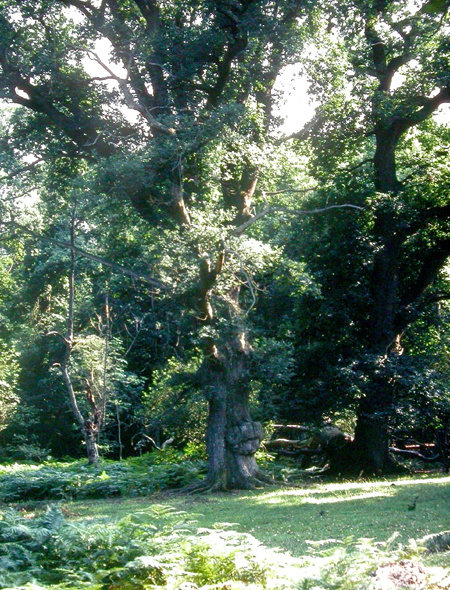 The New Forest consists of a mosaic of habitats which have been created by herds of grazing animals. These animals create areas of grassland known locally as lawns. The ancient New Forest woodland contains little regeneration, a more open shrub layer and a particularly impoverished ground flora. The tradition in medieval Britain for deer hunting by the king and his nobles created the New Forest, and the English medieval deer parks. Since William the Conqueror, the New Forest has been managed, one way and another primarily as a food resource for grazing animals. In order to understand the primeval woodland that dominated northern Europe and America between ice ages, and at the start of the most recent interglacial period, it is just so important to find out how it worked as a dynamic entity. It was the late, and great, woodland ecologist Francis Rose who, in the New Forest studied its dynamism, and I had the enormous privilege of being associated with him at that time. With all the grazing, the chances of a tree seedling surviving either beneath woodland canopy or out in the open was minimal. Oak was the dominant tree, and had a special relationship with jays. In the autumn, jays would hunt for acorns, and bury them in safe areas beneath thorny bushes and scrub. Jays overdid their food resource, and many of the acorns were never used. These would germinated beneath the thorny protective layer, and in their early stages, because of the starch stored in the acorn, they could develop in the low light levels beneath the thorns. After a few years, the developing sapling would poke its leaves above the thorny bushes, and further development would occur in full sunshine. 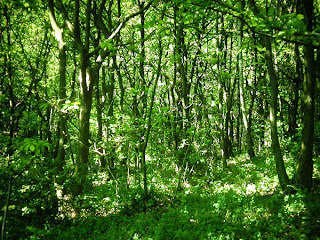 In order to develop new, high canopy woodland, the level of successful regeneration only needed to be extremely low. Anyone living beneath a mature oak tree will appreciate the incredible efficiency of the oak in regeneration. Lawns soon become carpeted with young seedlings. Gradually over the years, the few surviving oak trees develop with the bark of their young trunks protected from the ring barking of deer by thorny bushes, and eventually new oak woodland pushes its way into areas of lawn. 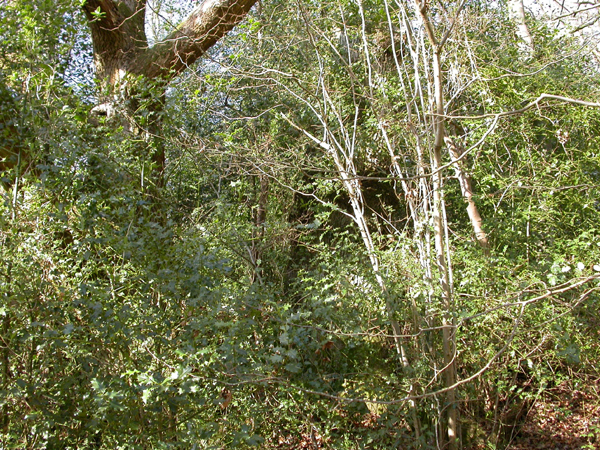 At this stage, the thorn bushes degenerate, and a ground flora in the wood having minimal regeneration and shrub layer beneath a fairly open canopy becomes the stable vegetation cover for several centuries. The unenclosed, ancient and ornamental woodland of the New Forest must closely resemble the primeval woodland before the ascent of man. East End Wood. New Forest Oak Woodland. By and by, the trees become over mature, and senescent, but not all at once. 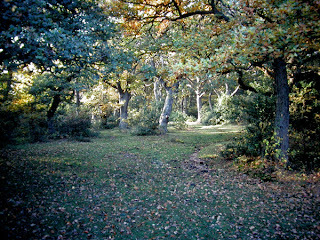 The canopy becomes more open, grazing animals remove most, if not all regeneration and the land reverts to lawn or heathland. In the New Forest where beech has been a native component of the forest, a beech dominated woodland develops under the opening canopy of senescent oak. Beech can germinate and develop under far lower light levels than oak, and its leaves are too acid for the taste of most earthworms. This results in the development of an acid soil, giving rise to open heath. Gradually the heathland plants improve the soil, and the cycle starting with thorny scrub, jays and acorns starts all over again. The above can easily be criticised as over simplistic. Of course it is. Other factors such as drainage, water levels, slope gradient, the presence of rocks and cliffs, and the nature of local geology, all would have had a profound effect on primeval woodland. 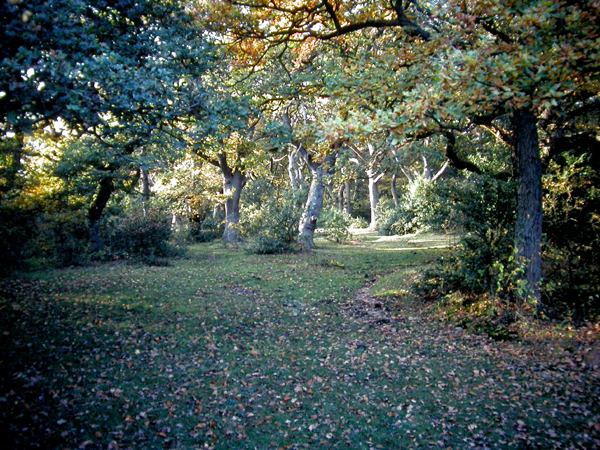 One of the great criticisms of the high levels of grazing in the New Forest has been that the shrub and herb layers of New Forest woodlands do not develop. It is well known that woodland inclosed against grazing animals develops bramble and other important shrubs. 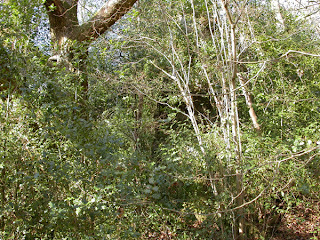 The open rides in this inclosed woodland provides habitat for insects, and especially butterflies that is impoverished in the open forest. As a result of well grazed, open woodland, the purple emperor is not a New Forest feature and the high brown fritillary has been extinct for several decades. Since this post is about woodland, I have not mentioned that other vital, and scarce habitat for which the New Forest is internationally renowned, namely valley bogs. 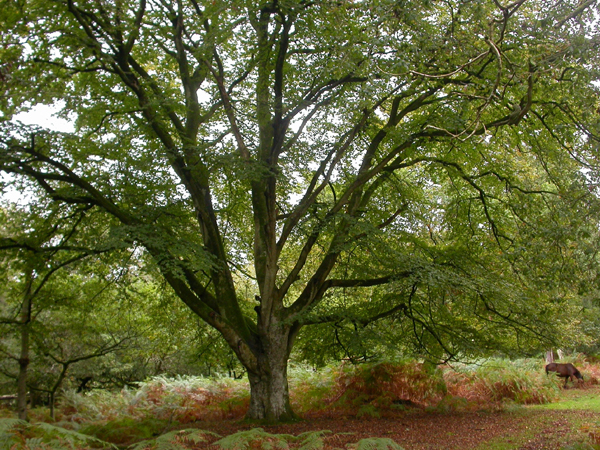 The New Forest is an assemblage of habitat variety that has taken centuries to develop. In the New Forest, the balanced management of grazing animals has resulted in its unique biodiversity. In most of the rest of Britain, woodland consists of coppice with oak standards, woodland managed for shooting and abandoned wood pasture. Because in the eighteenth century it became more profitable to graze animals in enriched, and artificially seeded pasture, grazing in woodland all but ceased. 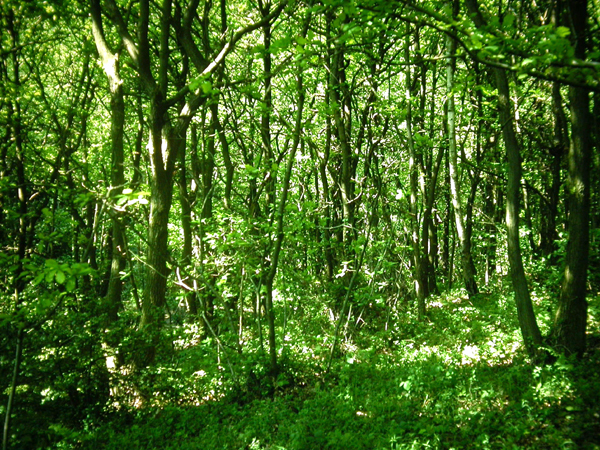 This has resulted in the development of woodland with very low light levels, a dense understorey of regeneration, often by non native species such as sycamore and an impenetrable thicket of holly, bramble and hawthorn. Flowering plants and insects survive in woodland rides, but beneath the dense canopy biodiversity is low. Even more alarming is the fact, pointed out by Franz Vera that, due to these low light levels, over the next few hundred years oak will be threatened with extinction as a woodland component. This is because it cannot develop beyond an early seedling stage without reasonable light levels. In this dense woodland, the only grazing animals present are deer. These have the irritating tendency of ring barking trees, and they are strictly persona non grata to many conservationists. As a result, much woodland is now fenced against the only available grazing, and this has produced a fossilised habitat with low biodiversity and of little use for recreation. as a possibly positive conservation activity.